The first meeting on the progress of the works had placed into the rooms of Galleria Doria Pamphilj where the restoration goes on. Marco Cardinali, Paolo Roma and Matteo Positano partecipated. 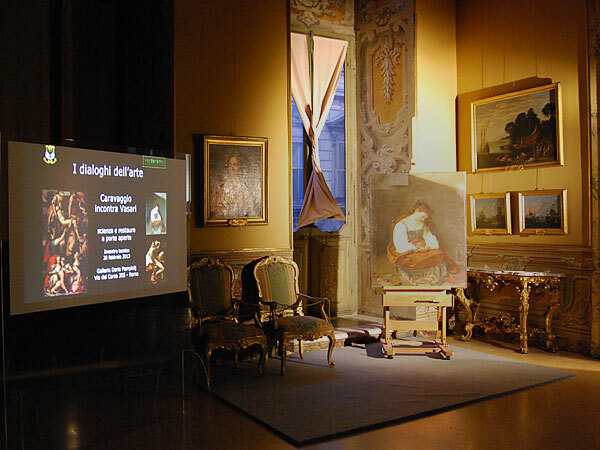 The first results showed are about the diagnostic research on Maddalena by Caravaggio and Deposizione by Vasari. They are the x-ray, the infrared photography (1100 nm) and the photography with ultraviolet light. Cleaning methods used right until now, the first info on materials and the pictorial technique were showed. Results of researches and documents on the different restoration phases are available now on the expositive panels in the entrance of places where works go on. Next technical meeting on the progress of works and researches will be on March 2013 20th, at 5 p.m.